As the old saying goes: "You can't put the genie back in the bottle." Nowhere is this more evident than with the spread of lionfish, an invasive, non-native species that is threatening the marine ecosystems across the Gulf of Mexico, Caribbean and Atlantic Ocean. And one researcher at Nova Southeastern University (NSU) continues working to learn as much about lionfish as he can. invasives, without any natural predators to keep things in balance, the one species can come to dominate the others." Johnston is also a member of the NSU Guy Harvey Research Institute (GHRI) research team. His latest research paper, published by the journal Coral Reefs, can be viewed online. 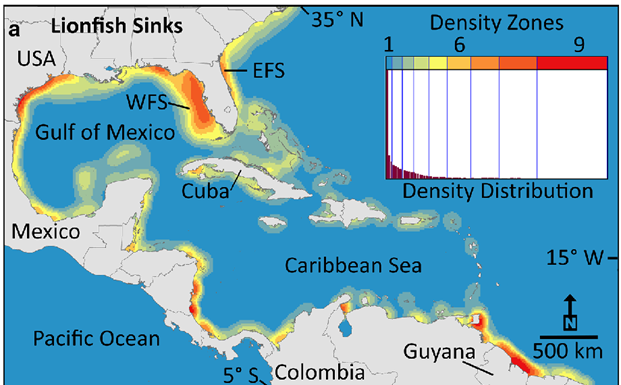 In his latest study, Johnston said that lionfish now permeate the entire tropical western Atlantic, Caribbean and Gulf of Mexico, but their numbers have been surveyed only in select locations in the field. What hasn't been shown is their potential abundance and the related effect high lionfish numbers may have on the "economically important" reef fishes. It is this data that is needed – and quickly – to help mitigate the damage lionfish could cause. Johnston said that whenever researchers examine a lionfish specimen they are finding all sorts of juvenile fish they've eaten, and therein lies the problem. With no natural predators to keep lionfish in check, they are free to reproduce in great numbers. Couple that with their propensity to eat a significant quantity of juvenile fish, it's only a matter of time until those other fish species start to see a decline in their numbers on the reef. 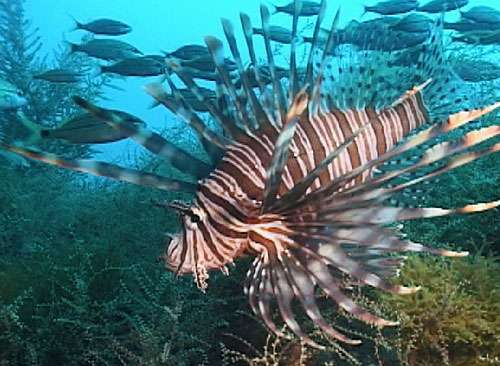 According to the study, the west Florida shelf and the entire offshore Texas coast could be on the verge of seeing dramatically high densities of lionfish, based on ocean conditions (water flow, etc.,) which help spread the invasive species and concentrate them to new areas. Johnston said that the west Florida Shelf is a high-production fishery, especially for red grouper, and that projection model shows the grouper in areas that are expected to have high lionfish populations in the future. "It's a never-ending battle as we'll never fully eradicate lionfish from our waters," Johnston said. "What we need to do is not only understand where they are right now but also work to forecast where they will be in the future. We also need to identify better ways of controlling their numbers, especially in deep water." Johnston understands that for many people, this threat doesn't resonate. "We're talking millions of dollars in the fishing industries – from catching and selling various fish to the hundreds of thousands of jobs and the recreational aspects of fishing," he said. "If left unchecked, there is the real potential that lionfish will have a negative impact on the fishing industry. After all, they are eating the same fish that our grouper and snapper rely on for food, and sometimes even the baby grouper and snapper themselves. In other words, it's likely that they are negatively impacting populations of the fish we like to eat, and at an alarming rate. That's why we must work to keep them under control so their impact on other fish is kept as reasonable as possible."